When I was in the hospital I was very concerned about leaving the truck behind because I had expensive chainsaws on the back along with other expensive tools. To my surprise everything was on the truck the way I left it. By far the best towing company experience!! 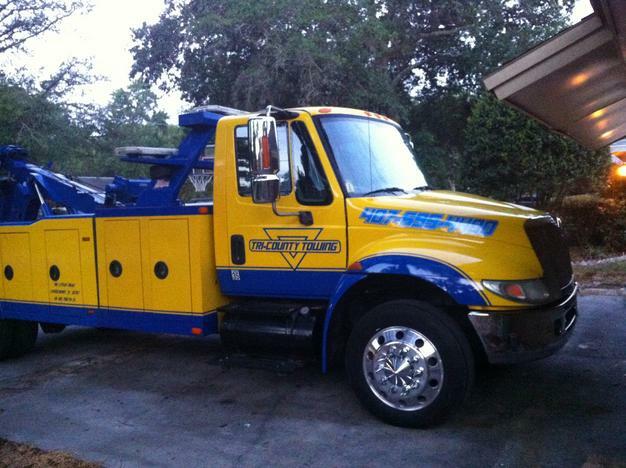 Thanks Tri County Towing for a model tow company!! I just had my very large mobile grooming van towed away by Tony. Its extreme weight and awkward angles made getting it on the truck difficult. Tony did an absolute amazing job and worked for a solid hour getting it up safely. He was very courteous and professional! Thank you Tony!!! I would like to thank you for the service I received after my accident. My car was handled with care and the office was polite and helpful when I called. Thank you.. I would highly recommend this towing company to anyone who needs a professional, efficient and knowledgable company. I had my trailer breakdown and my wife called them to see if they could tow a trailer. Tim immediately called me personally and came to assist me. He was very professional and courteous. We have used other towing companies before in this area and have to say this was first one I have been impressed with and will use again. I thank them for helping me out and getting to me in a timely manner. When we were stranded picking up items for a local theatre production in Habitat for Humanity's 16' box truck in Maitland, the Maitland Police called Tri-County Tow. Tri-County Tow moved us off the road and allowed us time to secure our items. They then towed us back to their shop, where some amazing people took a look at the engine and fixed it up on the spot so the truck could be back on the road and working for the community early the next morning. They worked with us on pricing, as we are a local non-profit, and we are so grateful! This organization is a friend to the community and full of great people-- THANK YOU!!! We were in desperate need of a car and Tri county tow came to the rescue. We had only one day left to find a car for our Relay for Life booth and when we thought we would be unable to find a car in time, Tri county tow helped us out and donated a car!!! They were efficient and helpful. If I am every in need of a tow they would definitely be the first I would call. Such a caring staff and overall company. We felt very blessed to have found such a generous group of people to lend us a hand when we needed it. I would recommend Tricounty to anyone and everyone in need of a tow! We are so impressed not only by the service of this company but by the humanistic qualities that they hold even when dealing with business. Tonight was our relay life for life and we needed a car for the car bash- we literally had one day to find one. Tri county towing had no hesitations and gave us a car right away. Not only that, but they were helpful and tried to get what we wanted!! Even though it was so short notice. This, as well, was a donation. They asked for nothing in return. We are so absolutely grateful for all they have done with us and I will forever recommend them. Relay for life is a cancer benefiting fundraiser and holds very dear to many of our hearts and we cannot believe how great they were in helping the cause. Thank you tricounty!! Tri-County Towing is the most reliable and honest tow company I have ever used. Over the last 20 years I have used their service many times and they have always been prompt to respond, fair in their pricing and pleasant to deal with. The need to have your car towed is never fun, but Tri-County towing makes it easier to deal with. The owner, Milt Williams is one of the most honest tow service providers I have ever dealt with. You can trust Tri-County Towing. What great service I received when I had an accident back in August. The staff was really helpful in working with my insurance company to speed up the process of getting my claim done. When my Honda was damaged in an accident you were quick to arrive and helped me get my car to the dealership easily. You really helped me out in a time of need. Thank you so much for such great service.